The 24th Annual Balla 10k race takes place at 7pm on Saturday July 23. 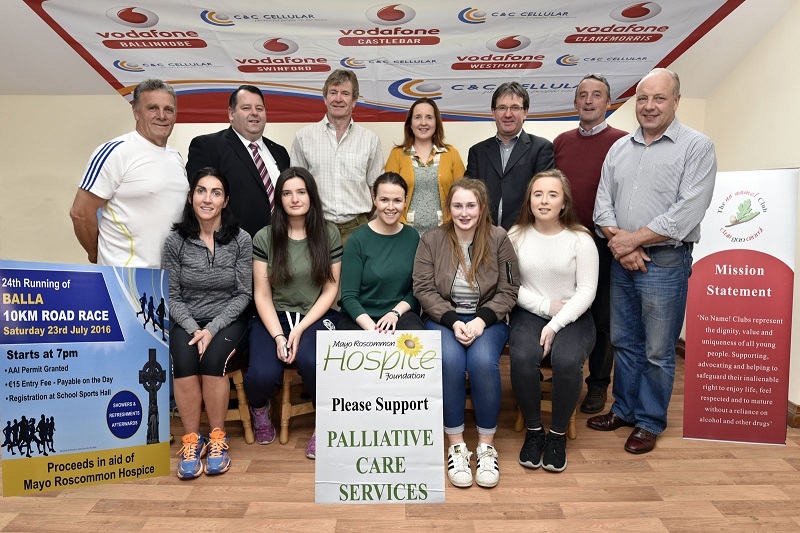 Pictured at the launch of the 24th Annual Balla 10k race, front l-r; Cathy Gleeson, Saoirse Fletcher, Chairperson Balla No Name Club, Laurita Blewitt, Mayo Roscommon Hospice, Aoife Conway, PRO Balla No Name Club and Lisa Mallee, secretary Balla No Name Club. Back l-r; John Timothy, Mayo AC, Bernard Guthrie, Office Pro (sponsor) , PJ Hall, Mayo AC, Caroline Mallee, Balla No Name Club, Gerry Curley, Office Pro (sponsor) , Brendan Conwell, Organiser and Joe Gallagher, No Name Club. Photo © Ken Wright Photography 2016. It's a race with a great tradition which has attracted top class fields over the years. It is an AAI permitted event through Mayo AC over a one lap course, with finish line at Balla Square on Main Street. The 10k is also a Target Race for Mayo AC members in their 2016 Vodafone C&C Cellular Club League. The Shebeen 2k race for boys and girls (under sixteen on race day) 2k starts at 6:30pm. Entry €5. Entry fee for 10k is €15. Changing/showers/refreshments/presentation and parking at Balla Secondary School. Two Team prizes - Athletic Clubs: first Men's and Women's AC team based on the combined times of their top 3 finishers. Event information from Organiser Brendan Conwell: 087 2941227.